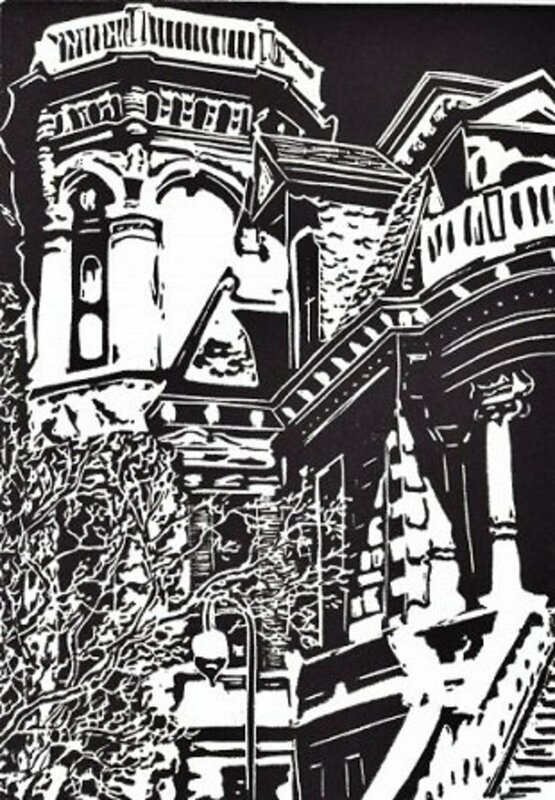 Original Linoleum Cut Art Prints—a.k.a. 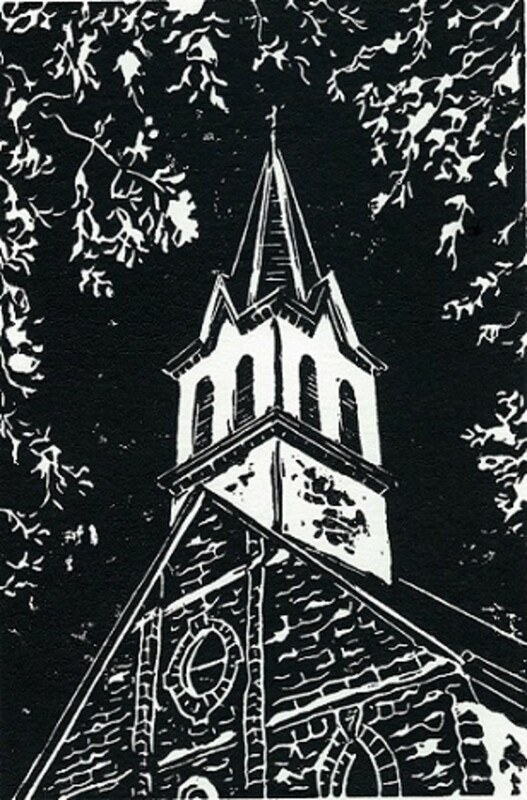 linocuts—are forms of relief printing or printing from a raised surface. 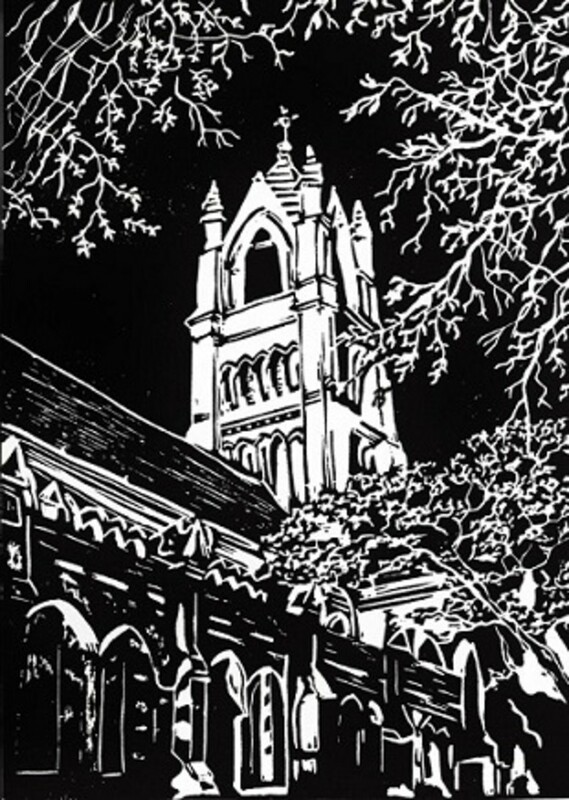 Woodcuts, wood engravings and collagraphs are other examples of this medium. The Chinese first produced woodcuts in the ninth century. Printmaking in this form came to Europe as it emerged from the Middle Ages and began the Renaissance in the early 1400s. Linoleum—a softer carving medium—was invented in England in 1863. 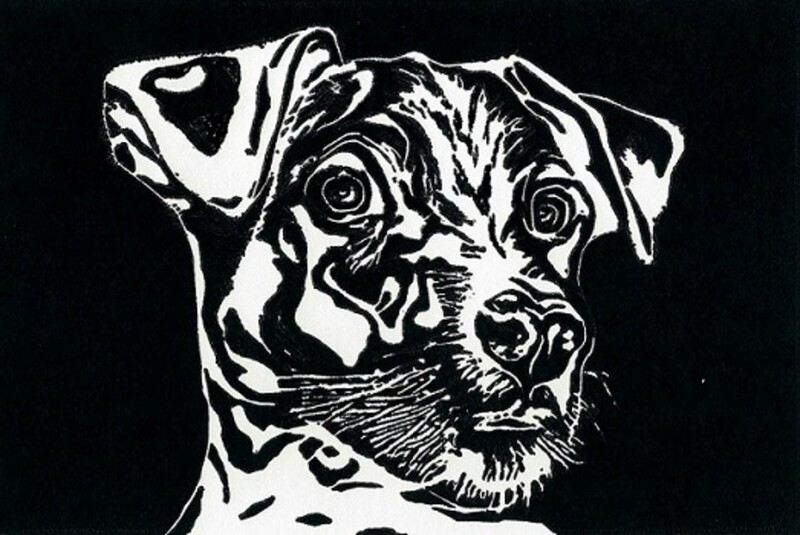 To create a linocut the artist must decide upon the subject matter and then draw the image onto a piece of linoleum which is often attached to a wooden block. This becomes the template for the final piece of art. For visual accuracy consideration must be given while drawing the original because images are reversed when printed. With sharp gouging tools the artist carefully carves into the linoleum removing what will ultimately become the white of the image. What is left untouched becomes the black or colored part of the image. A slip during this process creates a line and the part removed becomes a permanent element in the final product. If too much is removed the only recourse is to start over with a new piece of linoleum and hope for a steadier hand. Several artist proofs are produced during the carving process to see how the image is progressing and determine whether additional carving is needed. When satisfied the artist can proceed to the final printing of the edition. An angel can illuminate the thought and mind of man by strengthening the power of vision. To print a linoleum block a roller is used to apply a thin and even coat of ink to the surface. If too much ink is applied the thin lines and crevices fill in and cannot be seen in the piece of art. If too little ink is applied too much of the paper shows through the final product. Waste of paper and ink is unavoidable. After inking and pressing the acid free paper onto the linoleum the print must be allowed to dry. 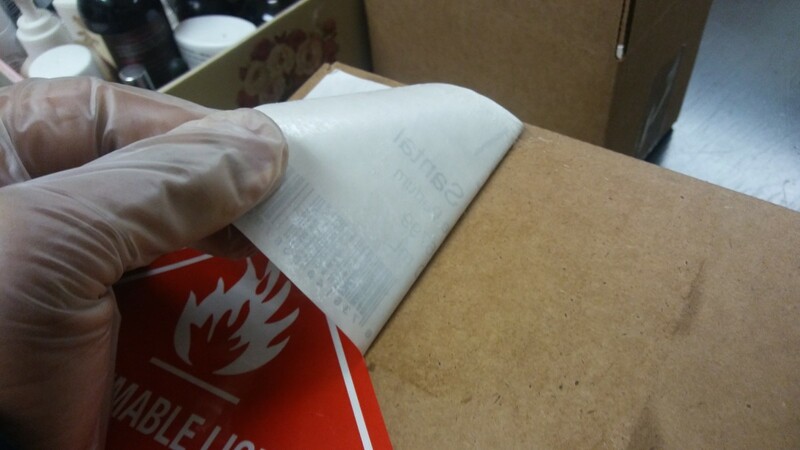 This can take days depending upon whether water, rubber or oil based ink is used. There are subtle and sometimes noticeable differences in each print as it is nearly impossible to always ink, press and get the exact same results from copy to copy. This is what makes each print an original. The method of pressing the paper onto the linoleum can be as simple as using the back of a wooden spoon or a brayer to roll and imprint the paper with the inked surface. 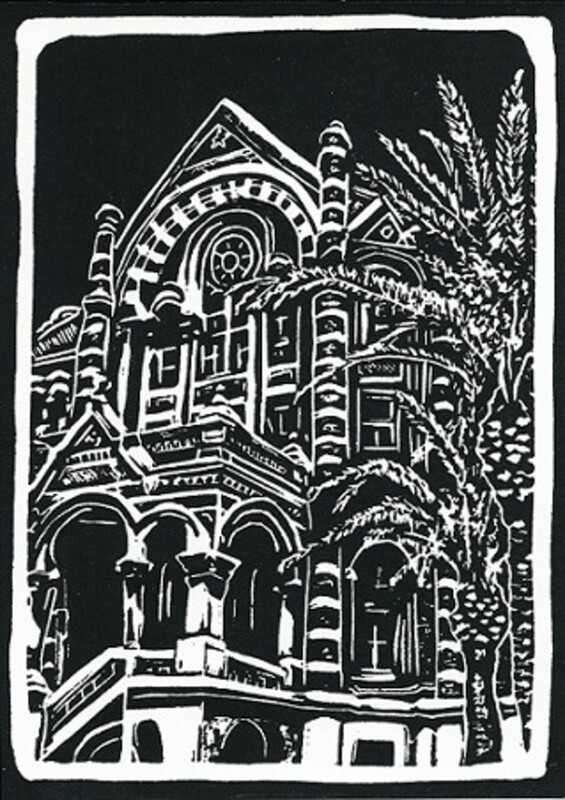 I have been fortunate to be able to use a 100+ year old printing press at the Printing Museum in Houston to print the majority of my linocuts. Only acceptable prints are signed and numbered by the artist. A Documentation sheet attesting to the authenticity accompanies all Original Linoleum Cut Art Prints by Peggy Woods. Trube House is viewed at the top of this page. "Noted architect Alfred Muller designed many buildings in Galveston, Texas and one of the most important houses that survived the famous hurricane of 1900 is the Trube House built in 1890. It is an interesting blend of Gothic and Moorish styling and adds significantly to the historic structures in this city known for distinctive edifices." Historic Galveston Church "This is the second reincarnation of the Sacred Heart Catholic Church on this site in Galveston, Texas. 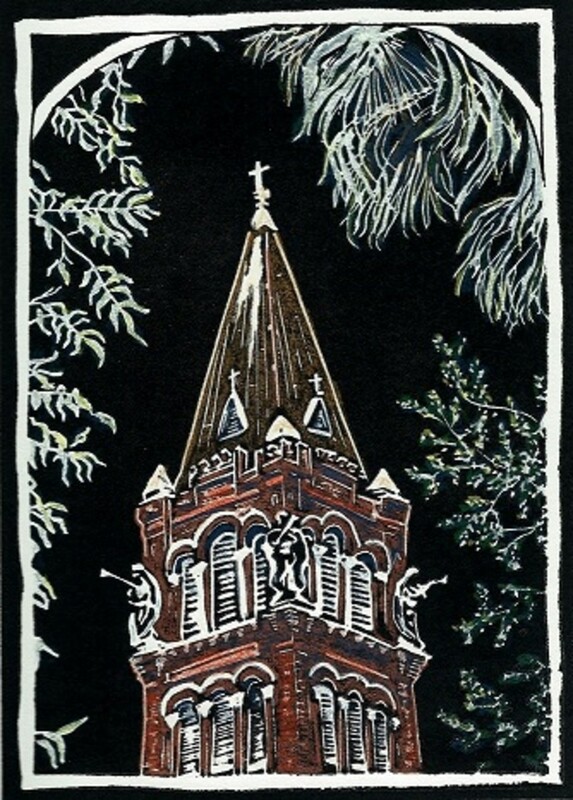 It was built in 1904 and the Onion Dome added in 1912. The first church was destroyed along with much of the city in the Great Storm of 1900. Its Moorish design is modeled after the Grand Synagogue of Toledo, Spain." Eaton Memorial Chapel "This beautiful chapel was designed by architect Nicholas Clayton in a Gothic Revival Style and was dedicated in 1882 as a memorial to the founding rector, Reverend Benjamin Eaton. A native of Ireland, Nicholas Clayton opened his own architectural firm in Galveston, Texas in the 1870s and became a major influence in the distinctive style of that city's historic structures." St. Patrick Church "Named after the Patron Saint of Ireland by its mostly Irish congregation, this Gothic structure, completed in 1877, was designed by noted architect and church member Nicholas Clayton. After the "Storm of the Century" in 1900 the building was raised five feet higher to meet new criteria for Galveston mandated by the U.S. Corps of Engineers. 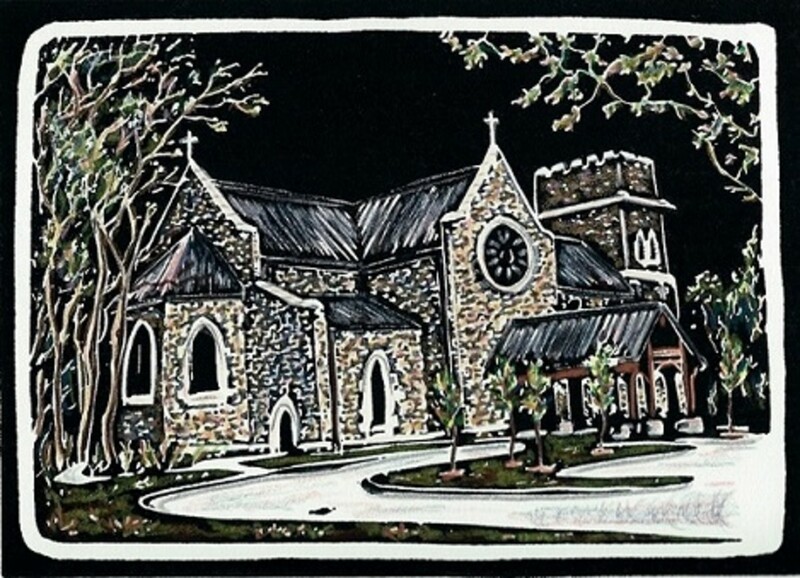 St. Patrick Catholic Church is listed by the Texas Historical Commission and continues its role as an active parish." Trueheart-Adriance Building "This historic structure in the Strand area of Galveston was designed by noted architect Nicholas J. Clayton; built in 1882 and housed the first chartered Realty Firm in Texas. The "Neo Renaissance, High Victorian" styled building is now occupied by the Junior League of Galveston." Elissa's Figurehead "Galveston, Texas provides a home berth to the Elissa, a tall sailing ship, which began its life in Aberdeen, Scotland in 1877. the Elissa carried cargoes around the world for over 90 years. Preserved and operated by the Galveston Historical Foundation with the help of numerous volunteers, she has been named a National Historic Landmark and can be seen at the Texas Seaport Museum. 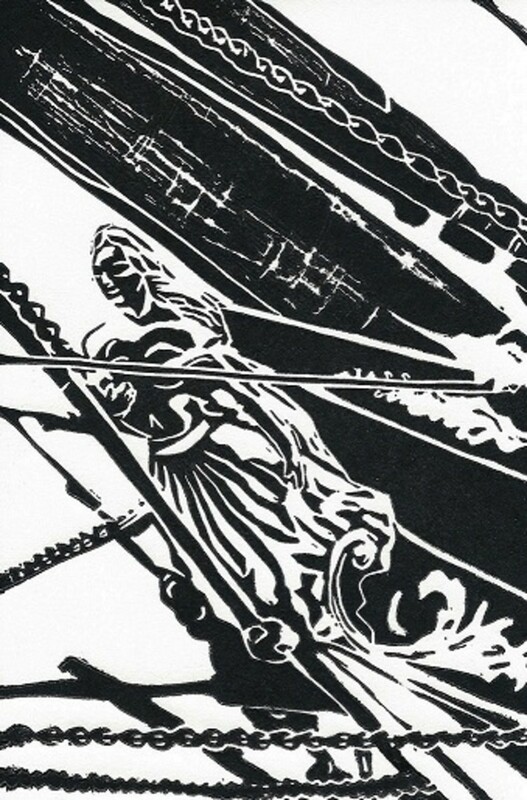 I chose to focus attention on Elissa's figurehead with the creation of this particular print." Old Red "UTMB, the University of Texas Medical Branch in Galveston, is graced with this beautiful landmark building completed in 1890. Noted architect Nicholas Clayton designed it in a Romanesque Revival style. Old Red, on the National Register of Historic Places, derives its name from the Texas red granite, sandstone and red pressed brick utilized in constructing this oldest medical building in Texas. With the exception of its original roof, the main structure survived the devastating hurricane of 1900. Old Red continues to serve medical students, faculty, staff and visitors with an architectural grandeur in a city filled with numerous historic and notable structures." Bishop's Palace "Designed by noted architect Nicholas J. Clayton for the family of Walter Gresham, a former Confederate colonel, attorney and legislator, this castle was completed in 1893 at a cost of $250,000 and is ranked among the top 100 homes in the nation for its architectural significance. It was added to the National Register of Historic Places in 1970. Constructed from native Texas granite, white limestone and red sandstone, its interior features rare rosewood, satinwood and white mahogany. The ornate wooden staircase took 7 years of work by 61 craftsmen to complete. Fireplaces from all over the world are showcased and the mantle in the ballroom won 1st place at the Philadelphia's World's Fair in 1876. Purchased by the Catholic diocese of Galveston-Houston in 1923 to serve as a home for bishops of the archdiocese, the mansion is now open to the public. It is located at 1402 Broadway in Galveston, Texas on a boulevard lined with numerous other opulent and important structures." 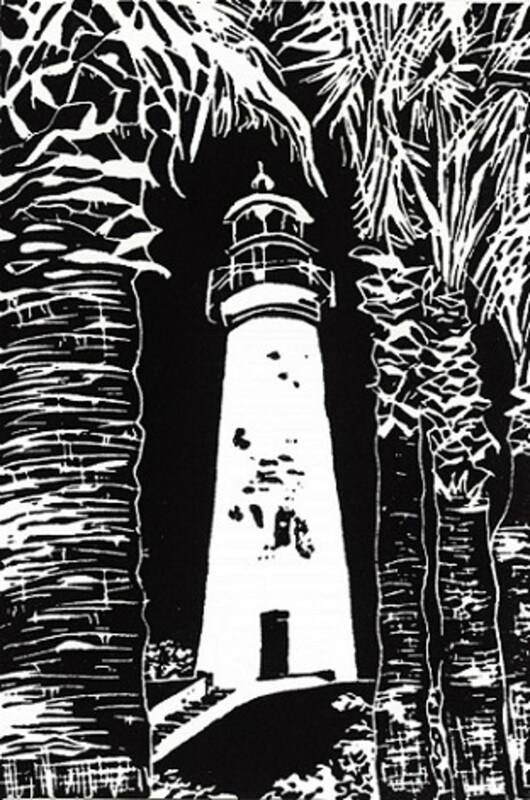 Which Galveston Linocut is Your Favorite? The Alamo "The Alamo...memorialized in legend, glamorized in film and glorified in song and verse...was established in 1718 as the Mission San Antonio de Valero. In 1836 the building became a fortress for the Texas army leading to a famous 13 day siege by overwhelming Mexican forces. Today it is known as the "Shrine of Texas Liberty" and is the most visited tourist site in the state." Los Patios "This delightful place is located in San Antonio, Texas. It is situated along the Salado Creek in the northeast part of the city. Originally started as a gardening nursery, the beautiful oak tree adorned grounds now have restaurants and shops to interest a variety of tastes. White and black swans glide down the waterway and the verdant surroundings are also festooned with the sightings and sounds of peacocks as well as other birds. 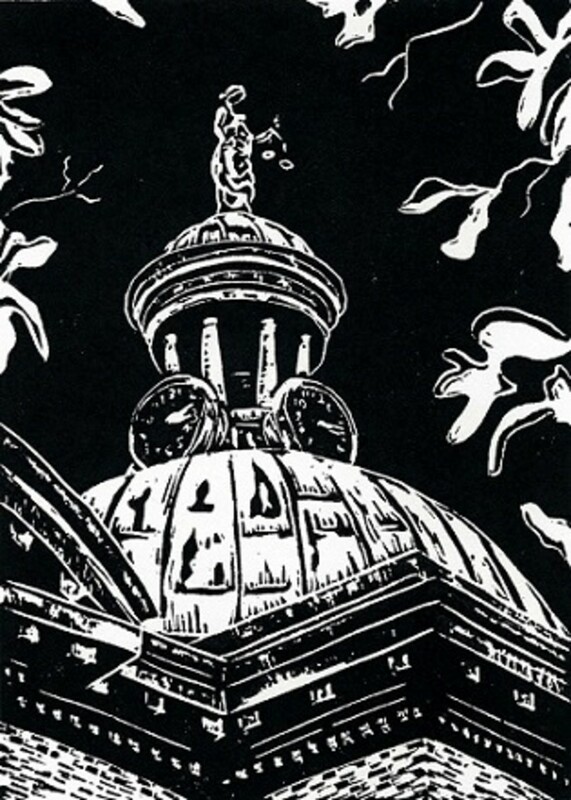 This particular print originates from a picture that I took of The Galleria with its historic window that was once the entrance to the Old Katy Railroad Depot in San Antonio. It was moved to its present location in 1968." Classically Adorned "Stylized columns such as these are indicative of elegant homes around the world where beauty is combined with the function of structural support. 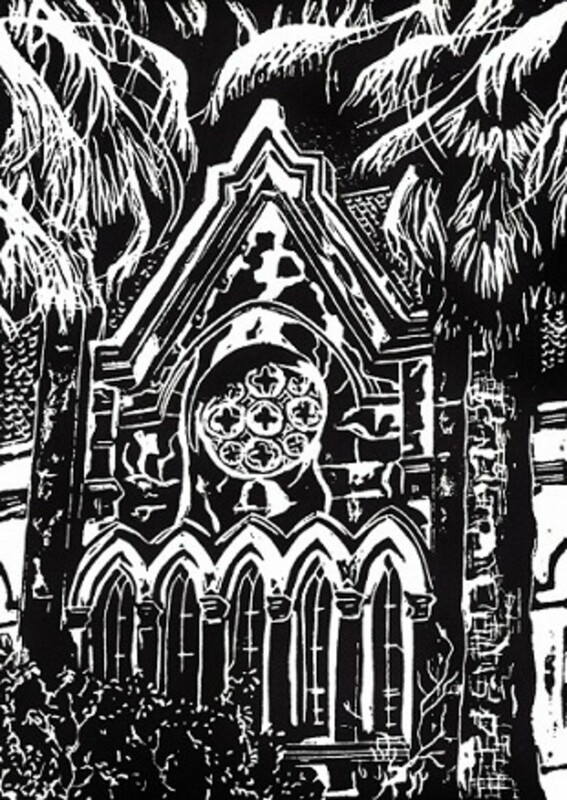 This original linocut was inspired by viewing an attractive home near the historic King William District of San Antonio, Texas." 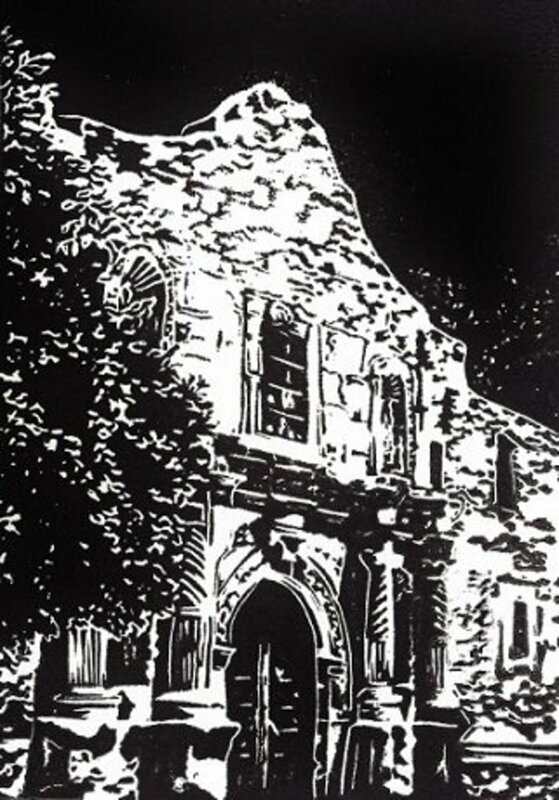 Which San Antonio Linocut is Your Favorite? Herrenberg, Germany "This is a street scene in the old medieval town of Herrenberg in the southern region of Germany. This happens to be the birthplace of an old friend of mine dating from our former working days as operating room nurses at the Methodist Hospital in Houston, Texas. The baroque domed building in the background is the Collegiate Church that Martha attends and it is over 700 years old. It houses an important bell collection in its tower. The town is ancient by our standards and so very charming to experience." St. Blasien "In 1997 I traveled to Germany to visit a long-time friend of mine. We met each other when we were fellow operating room nurses at Methodist Hospital in Houston, Texas. Martha was able to show me many beautiful sights including the town of St. Blasien. A huge domed former Benedictine Abbey dominates the landscape of this small town in the southern region of Germany. This building with the winged creature atop its roof drew my interest." Fortress Marienberg Passageway "While visiting Wurzburg, Germany with an old friend of mine, we took a bus ride over the Main River and up the hill to the Fortress Marienberg. It was a fortified retreat around 1000 B.C. and has since served various purposes such as a church, fortified castle and Renaissance palace. Now it dominates the landscape and serves as a museum with collections of art, an armory, etc. 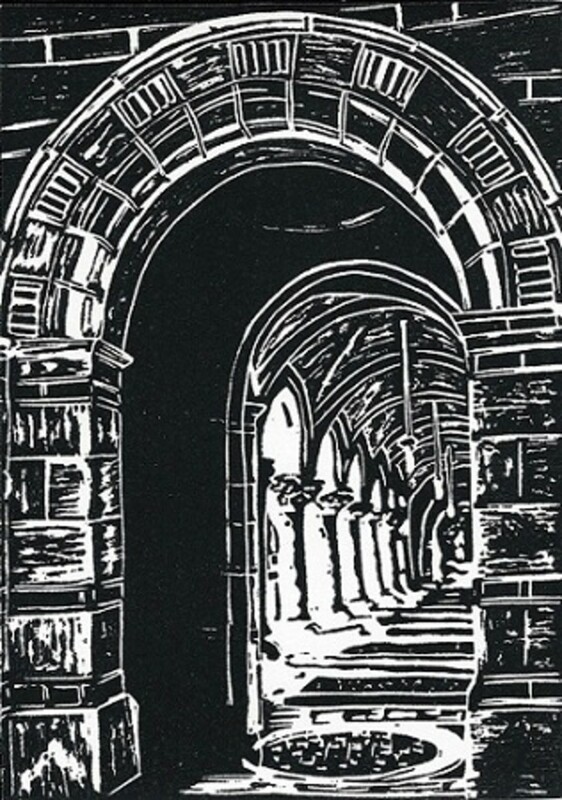 I thought that this passageway between buildings was interesting subject matter for my camera and now my linoleum block art prints." 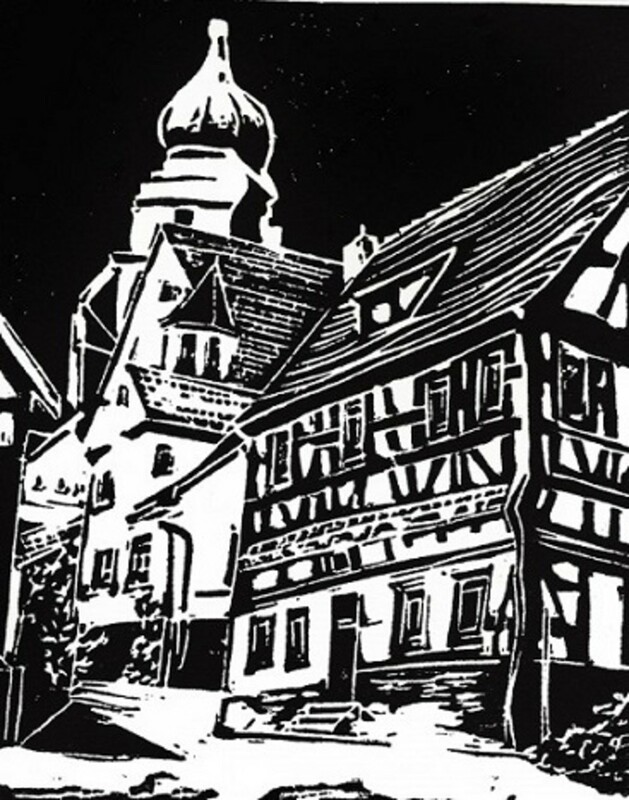 Which Linocut from Germany is Your Favorite? For my linocut documentation sheets I used appropriate quotes for my grape prints. 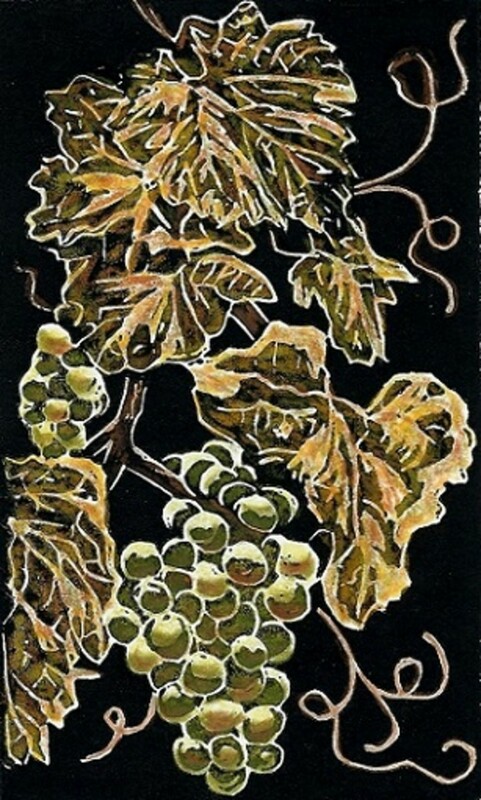 Each of my On the Vine linocuts I chose to hand color. 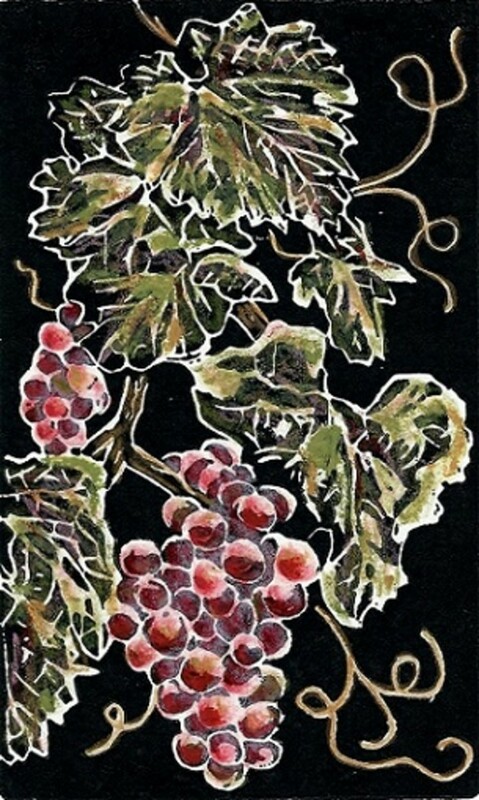 In some cases I also hand colored some of the smaller grape images. The juice of the grape is the liquid quintessence of concentrated sunbeams. 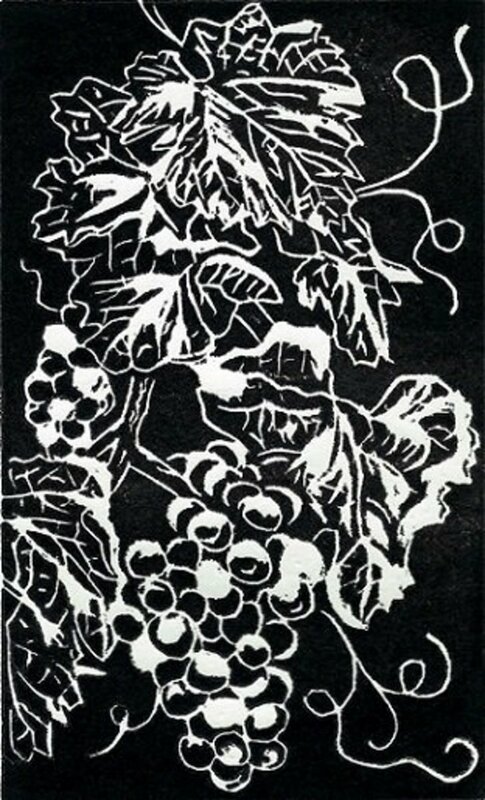 The black and white linocut image of grapes. 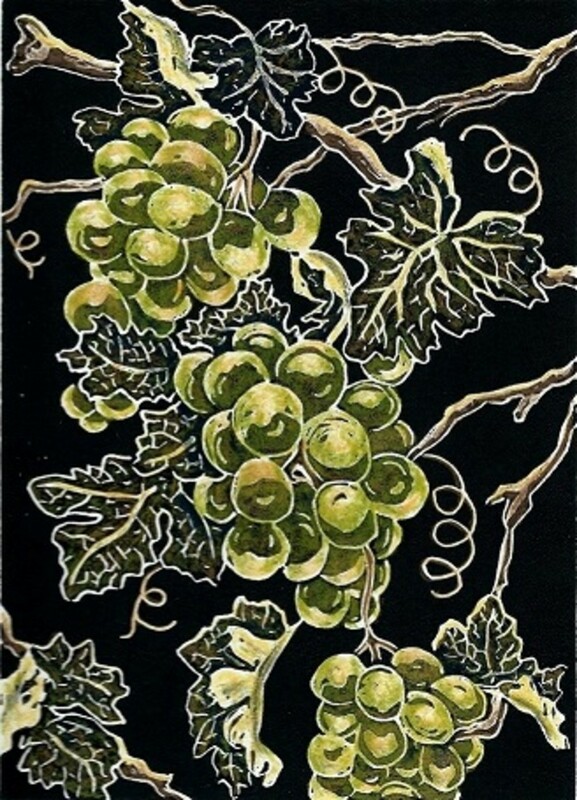 The hand colored linocut versions of the grapes. 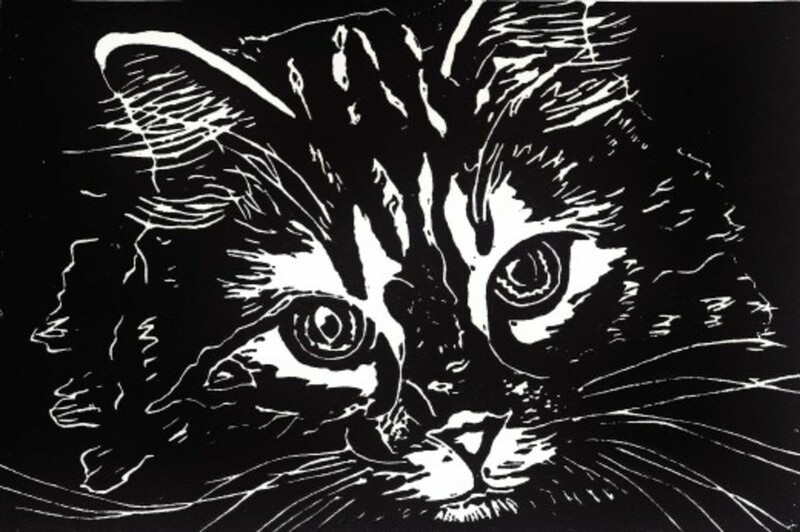 Untitled linocut by Peggy Woods - Documentation sheet reads Hooray for Animal Shelters! I have had some fun creating images of birds and animals. 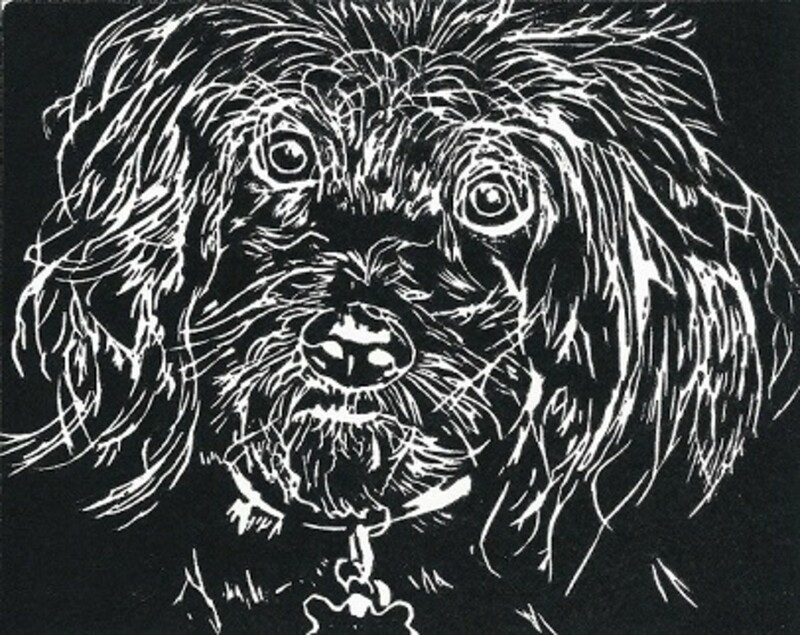 Some of the linocut images were inspired by family pets. 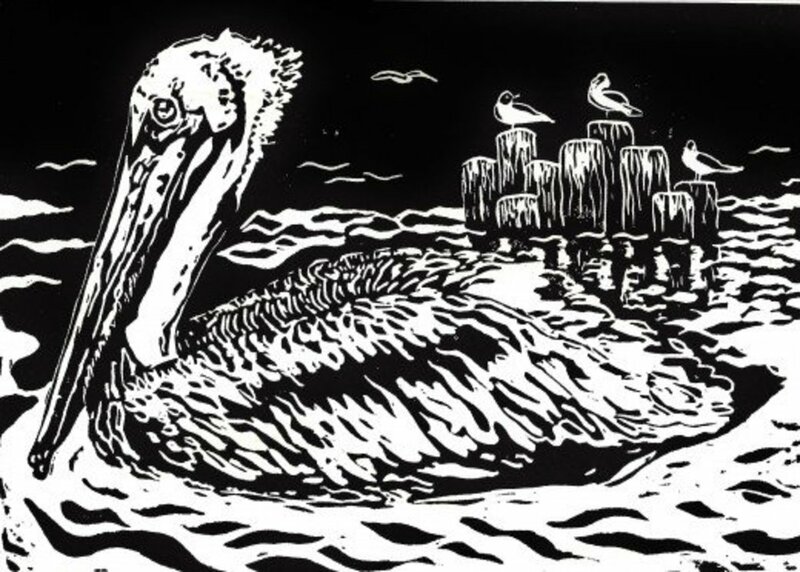 In the poll below the linocut of "Ben" is the second image at the top of this page. Which of My Bird or Animal Prints is Your Favorite? Crowning Tribute by Peggy Woods - The 32 story Niels Esperson Building in downtown Houston was the tallest structure in Texas when it opened in 1927. 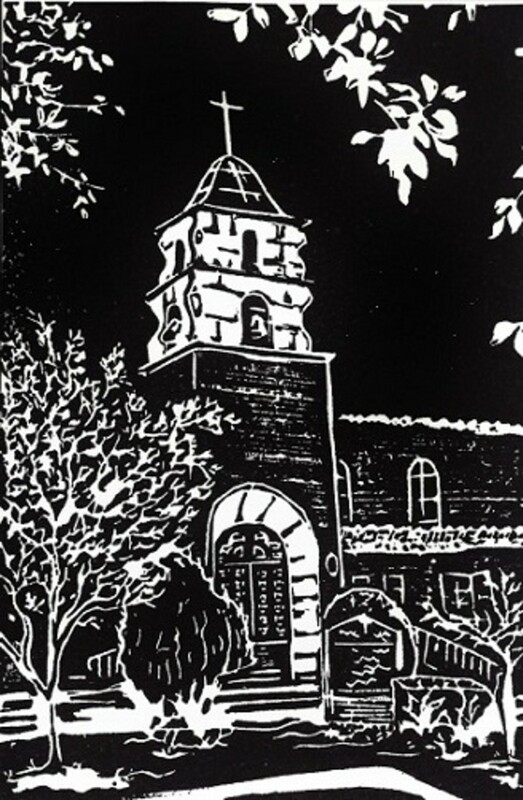 Which Linocut of Places in Texas is Your Favorite? 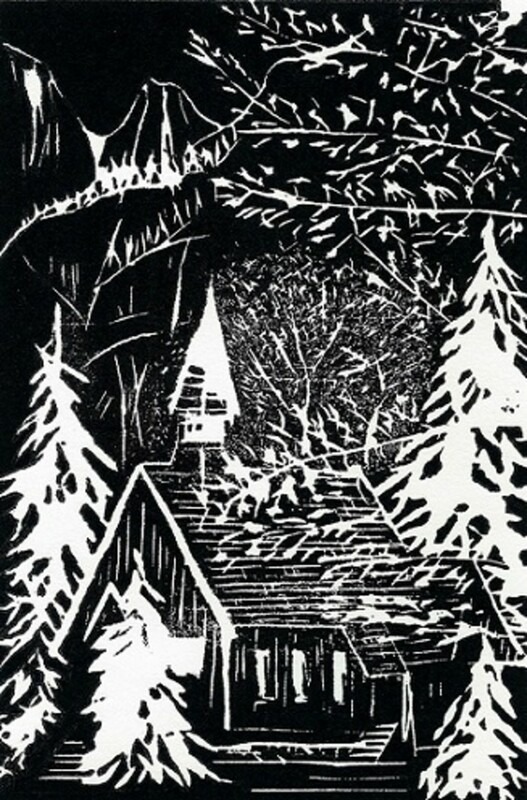 Untitled (Peaceful Valley) by Peggy Woods - This is the very first linocut I ever created. Is the linoleum cut print process much different from just using wooden blocks to carve as prints? Do the prints come out looking qualitatively different? That is an excellent question. Depending upon the wood used there may or may not be much of a difference in the final product. If the wood is heavily grained that could potentially become a part of the image when printed. Wood is a harder surface than linoleum so the actual carving process might also take a bit more effort. It is nice to be able to introduce you to this form of art. I am happy to know that you appreciated the article. These are all beautiful. It's hard to choose a favorite. I've never heard of this type of art before, so thanks for writing such a great article about it. 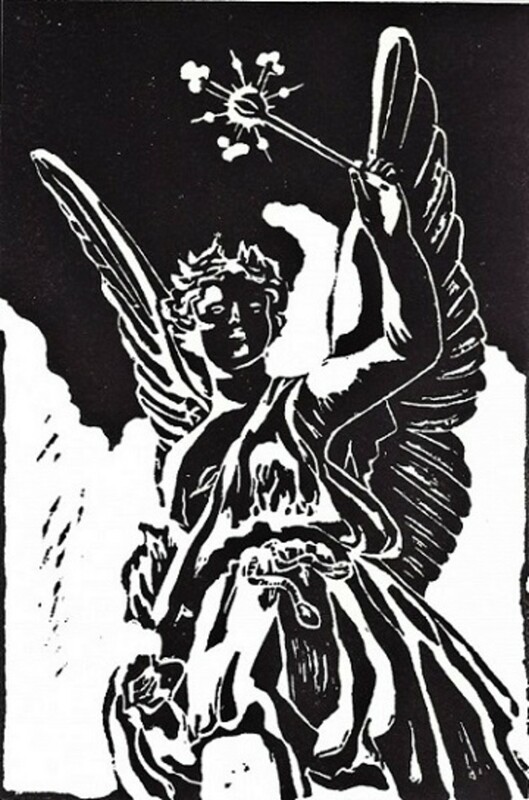 I am happy to be able to introduce you to linoleum cut art prints (aka linocuts). We collected some woodcuts prior to my making linocuts. It is a similar process. 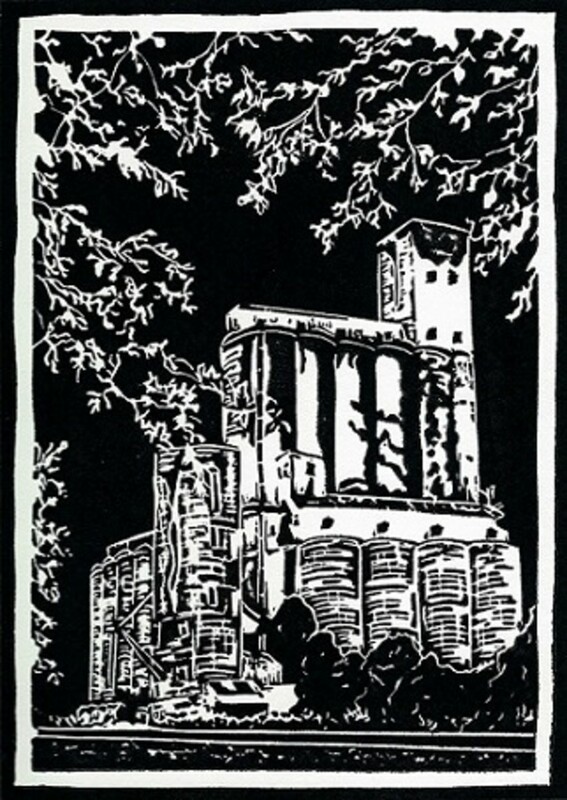 I have to admit that I have never even heard of linocuts so thank you for bringing them to my attention. I will send this over to the wife as I think she might like them too. She is always looking for art to collect and hang at our house. Linocut images printed on tote bags would be a nice way to display them. The very first image I ever created, I forgot that it would reverse when printed. So I just call it Peaceful Valley. The actual image was of a little chapel in Yosemite Valley. Glad you enjoyed my art. I have created other types of art in addition to linocuts. Wow, Peggy, I didn't know that you were such an artist! Your linocuts are beautiful! I wanted to try this myself but have a hard time with the idea of the reverse image. I remember do this in an art class and had a hard time with the concept. I would like to try to print those types of images on tote bags. It does take a steady hand when carving a linocut and then using the right amount of ink when pressing it. There is a definite learning curve to master. Thanks for letting me know which print you liked best. What a creative work of art! They are so lovely. Seems like a process requiring detailed work. I do love the grape vine the most, very expressive. 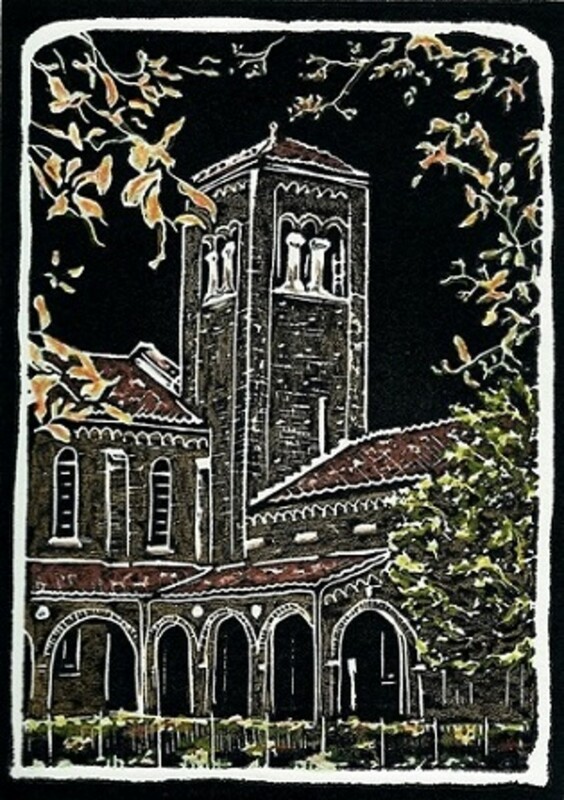 It is nice that you were introduced to creating a linocut in an art class. I learned how to do it as an adult in a class at a local community center. It opened up a new method of printing combined with art to me and introduced us to people we might never have met because of doing so. Thanks for your complementary comment. Thank you so very much for the compliments. Burnt sienna is a lovely color. (Smile) Our Lady of Walsingham is such a beautiful church in the Spring Branch area of Houston. I agree with Paula oh my Peggy you just shine...I cant afford art school can I just come sit over at your house I will hand you the paint..burnt sienna coming right up ma'am! the walsingham church is my favorite so far....reminds me of the church they use on the BBC series midsomer murders its so cool now I want even more to come two states over even more! excellent art and supreme article Peggy! Thank you, Paula. Much appreciated! My compliments are sincere and well deserved! Thanks for your effusive compliments on my linocut creations. Peggy.......HO-LEE!! People like you with such amazing artistic talent, simply blow my mind!! Seriously. I look at art like this and just wonder how someone does it! IMHO, it is a true God-given gift! I am certain, I could go to the most prestigious art school for half my life and still not be able to do what you do. This comes from being gifted!! And Peggy, you have THE GIFT!! W O W !! Thanks for the compliment. The Galveston Historical Society and the Moody Mansion in Galveston are currently selling my Galveston prints. I have a place representing my work in Houston but should probably put them online somewhere. 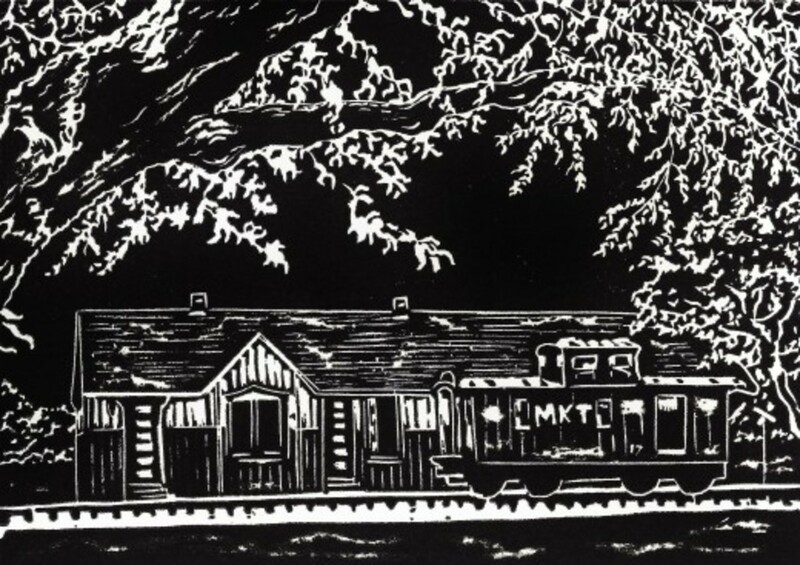 Your linocuts and woodcuts are nothing short of gorgeous. 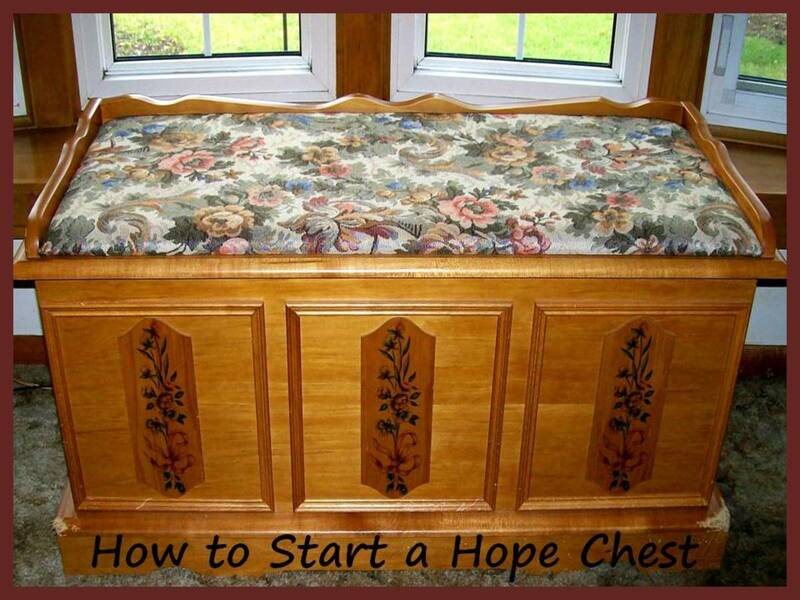 I placed your first article on this subject on one of my arts and crafts boards (Crafts and Instructions) and I'm posting this article to that same board. You need to make these cuts available to the public. I feel certain they would be a success, particularly if you continue to match your incredible skill to cuts of well known landmarks. Lots of people would love to have a really high quality souvenir of their travels that would make a beautiful addition to their homes indefinitely. I would have loved going to an art school. Art is something that has captured my interest all of my life. Printing can be a messy business. Haha! 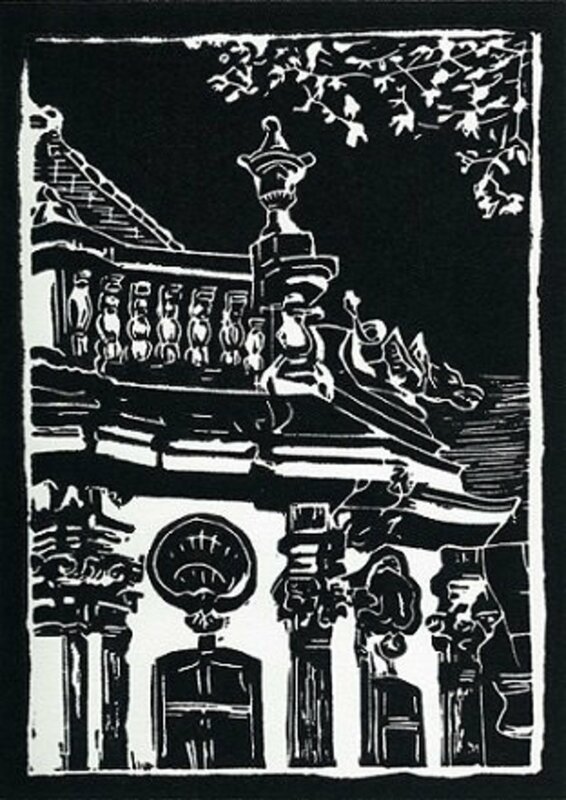 It is nice that you were able to learn about this art form and actually create some linocuts when you were in school in the 1960s. The art class that I took in high school back then did not address it. We did a painting, made a ceramic piece and studied art history. I learned how to do this as an adult at a local community center. I am glad that you liked these linocuts of mine. Enjoy your day today! Peggy, this hub is a work of art and you are a fantastic artist. I got the feeling that I have seen this hub before, if so it is still beautiful. It does take a bit of practice to get the prints to turn out well. Thanks for taking a look at my creations. Thank you for introducing me to this beautiful art form. It must take patience and skill to create such pieces on print. You must have had a good art class in school. I learned how to create linocuts as an adult. 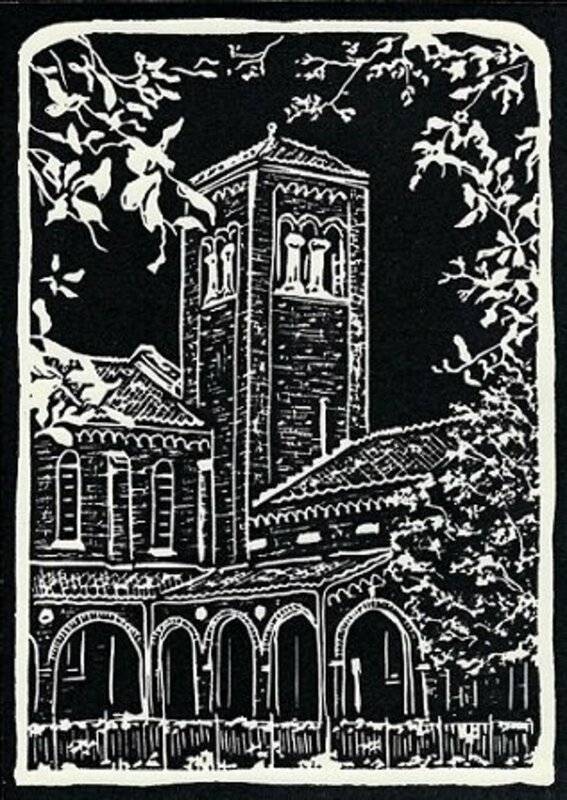 The schools I attended never taught how to make a linocut. Thank you so much for sharing my article with others. 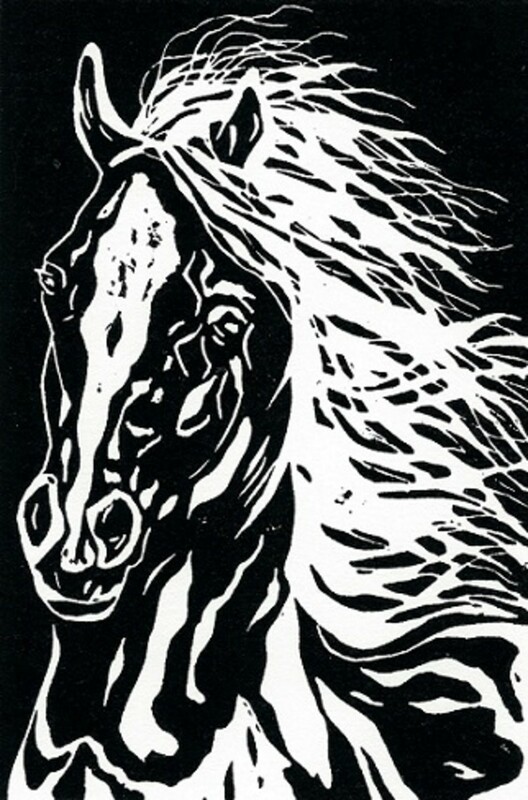 It is always interesting to me to find out which of my linocuts becomes most favored. These are beautiful. I remember doing linocuts in school, but nothing nearly this detailed. FYI - I also submitted it to Reddit. Hopefully, that will get it some additional views. Wow! You are really talented! Some of them seem so intricate. You not only have to be able to sketch and draw but to carve as well to end up with the finished product. I just met someone last night who does wood block carvings. I'm going to share the article with him and post it to my facebook page if you don't mind. 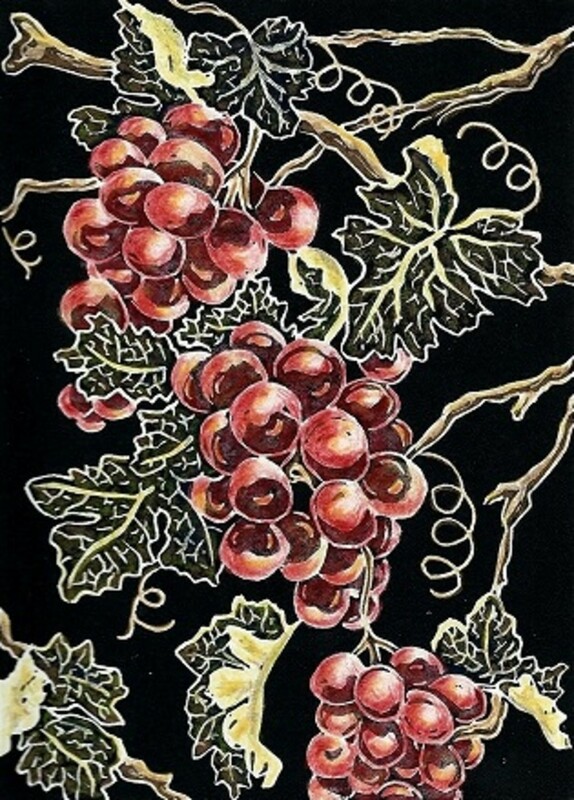 I think of all of the prints, the one of the red grapes was my favorite but I also loved the angel. Thanks for sharing this with us. I hope you'll do another article about your work soon. Nice to be able to introduce you to the linocut art form. Thanks for your comment on my pieces. I've never heard of linocuts before reading your article. This is beautiful! And your linocuts are stunning. I don't share your remarkable talent (I can't draw a straight line with a ruler) and am so in awe of your images. Thank you for sharing this art form with us. I am happy to be able to introduce you to this type of art. 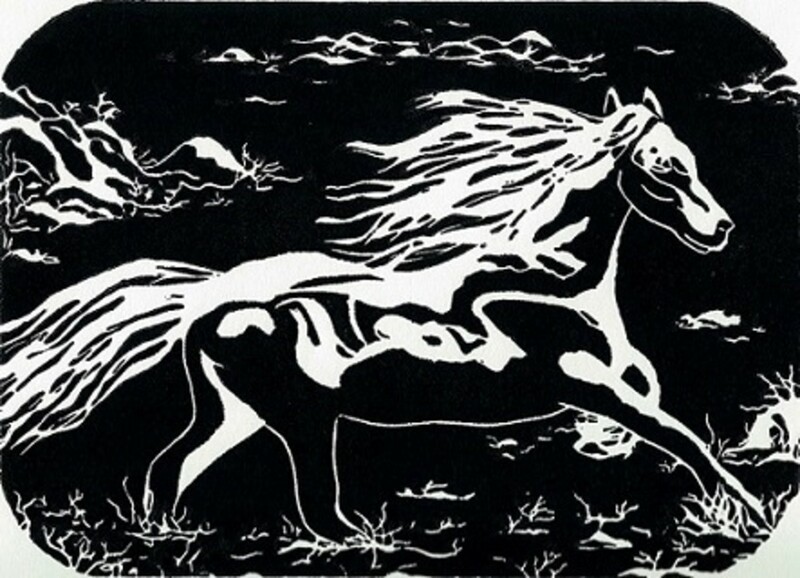 Thanks for your comment regarding my original linoleum cut art prints. Good luck with your efforts in making some linocuts of your own. The nice thing is that you do not need that many tools to do it. Also if the end result is not pleasing you can always start again. That does happen! Not everyone of them is a masterpiece judging from my own personal experience. 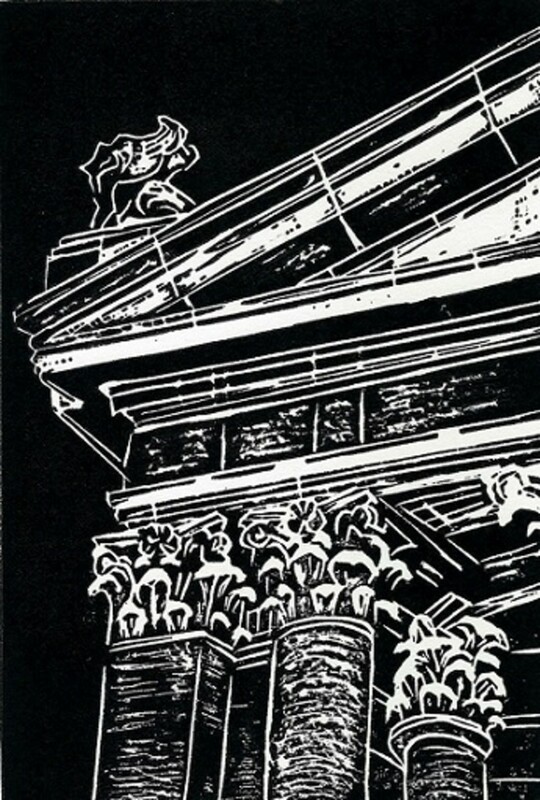 Surely a lot of time, dedication, and patience above all, must have gone into making these linocuts. This was a educational experience as well, having no prior knowledge of this art style. 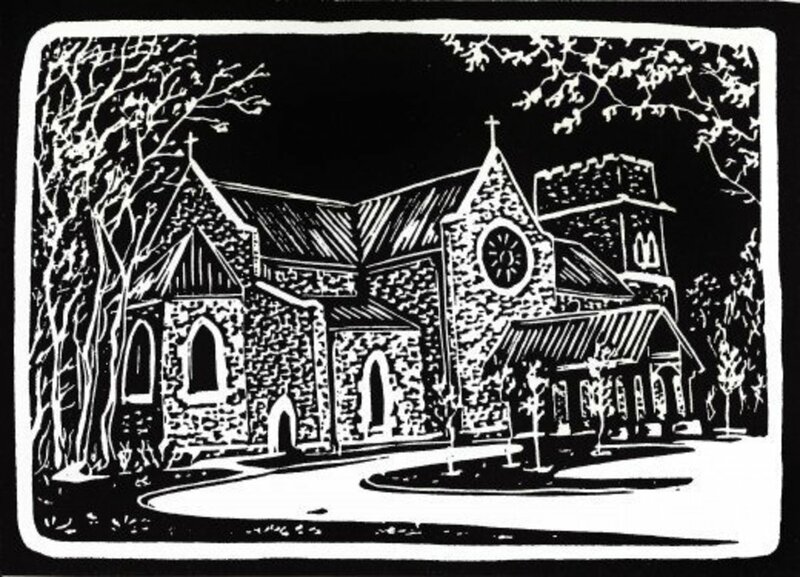 I have featured some of my linocuts in specific articles related to a particular location but decided to assemble almost all of them in one place which is what I did in this post. I am pleased that you like them. Sending good thoughts your way today. As to the type of linoleum used for creating my linocuts...I simply purchase mine already attached to blocks of various sizes at art supply stores. I do not think it is any special type of linoleum. Thanks for stopping by and leaving a comment. 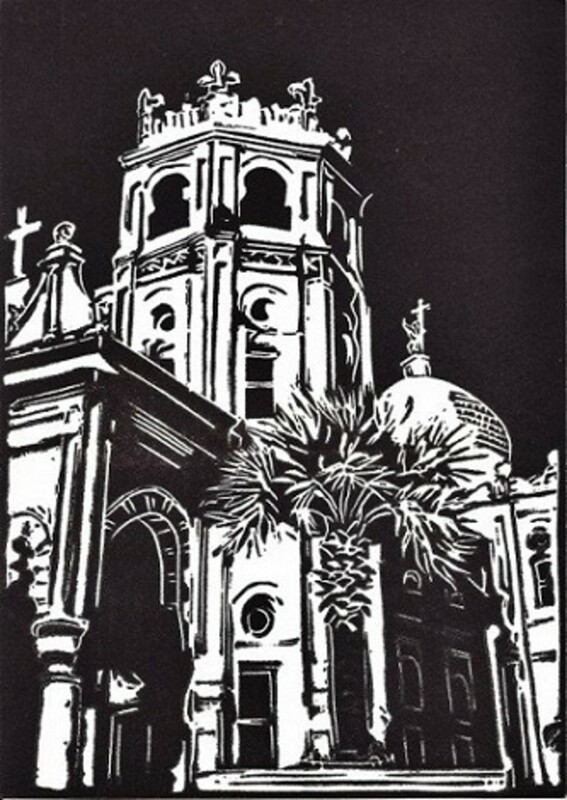 It was fun creating these linocuts and I may be creating more soon of some more Galveston images. Will plan a trip down there soon to take photos of some of the historic sites. I wasn't aware of this art form until I read your article. It looks like it would be fun to do, and you are very good at it! What kind of Linoleum do you use? You are so talented and so creative. These are super fine works of art and very neat. Needless to say, it requires creative skill with lot of patience. Difficult to choose the best, all are wonderful. Thanks for voting which of the linocuts were your favorites and leaving your welcomed comment. Very informative and interesting work. I really liked reading about linocuts and also enjoyed voting for my favorite ones. I admire your talent and creativity ma'am. I guess it does take a bit of creativity or at least a mindset and persistence to create art. Then again...art is "in the eye of the beholder" as the old saying goes. 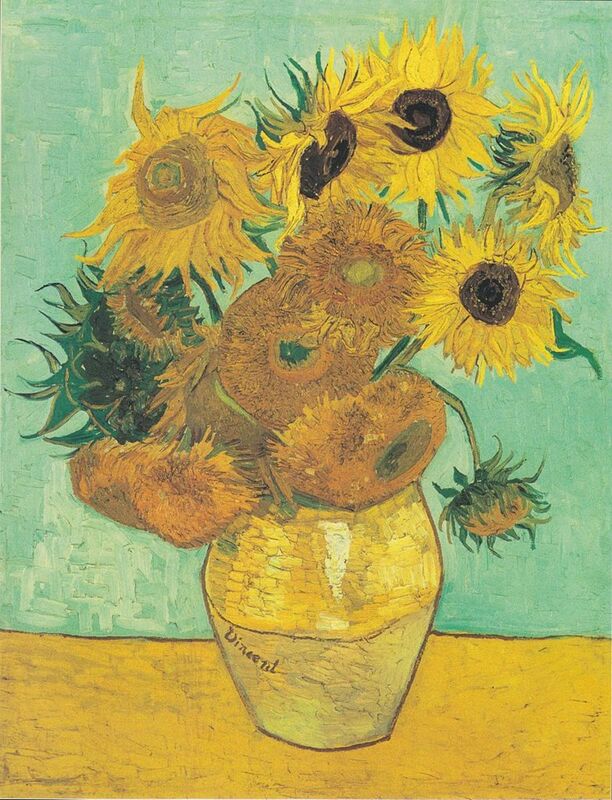 What one person sees as art may not necessarily be another person's definition. Thanks for the Independence Day greetings! To answer your question...creating a linocut does take a bit of time because all efforts are not necessarily successful when carving. Even after that every print does not come out as expected. So putting it all together...time is definitely a factor. Thank you for the 4th of July greetings! Happy Fourth! You forgot to mention in your "how-to" that first, you have to be an awesome artist. Lovely images. Thanks so much for sharing these. Peggy you are a great artiste. I admire this quality in you. Linocuts must take so time, no? Happy July 4th 2018. Happy 4th of July to you also. 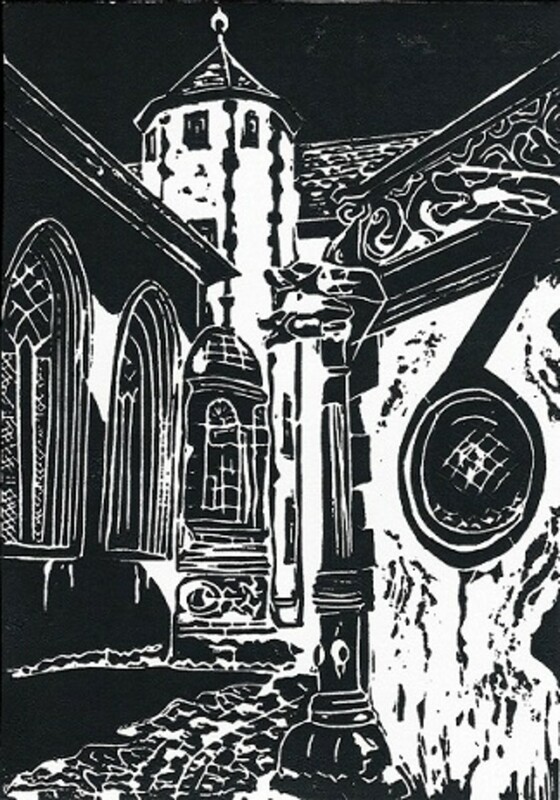 Thanks for taking the time to look at my linocuts and leave a comment. 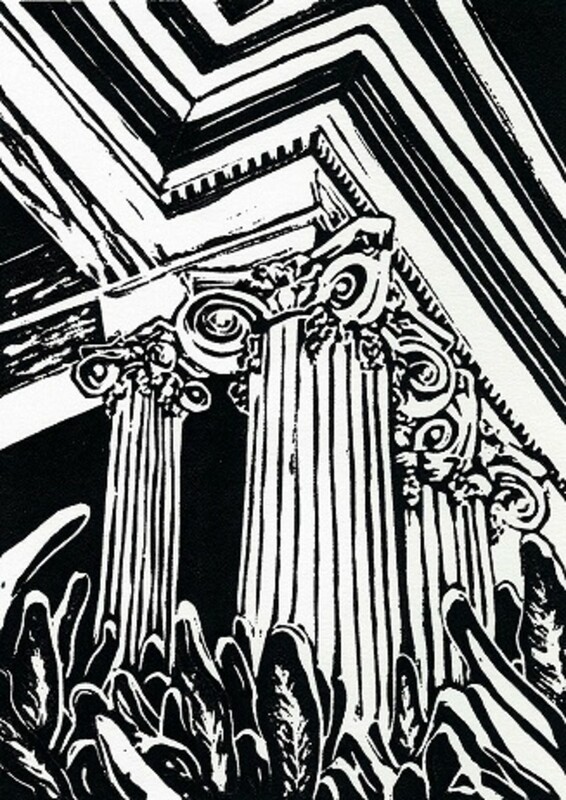 Thanks for taking the time to vote for your favorite linocuts in the polls. As more people vote it will be interesting to see if the percentages change. The art class that I took in high school was an elective and creating linocuts were not a part of the curriculum. Nice that it was when you attended high school. I remember making a ceramic piece and doing an oil painting. Of course a great part of it was studying art history. Hard to choose from your beauties. You are so gifted! I had fun voting for my favorites! Beautiful work! 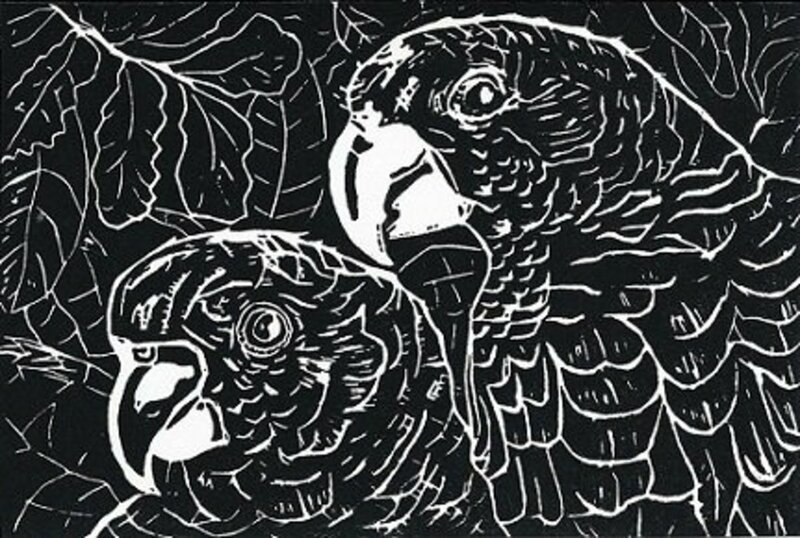 Enjoyed seeing all your examples and the info you've provided on linocut work is interesting. I remember the opportunity to try my hand at this in high school art. It was very appealing work. Thanks for taking the time to vote in the polls as to which one was your favorite. I am finding the results interesting. 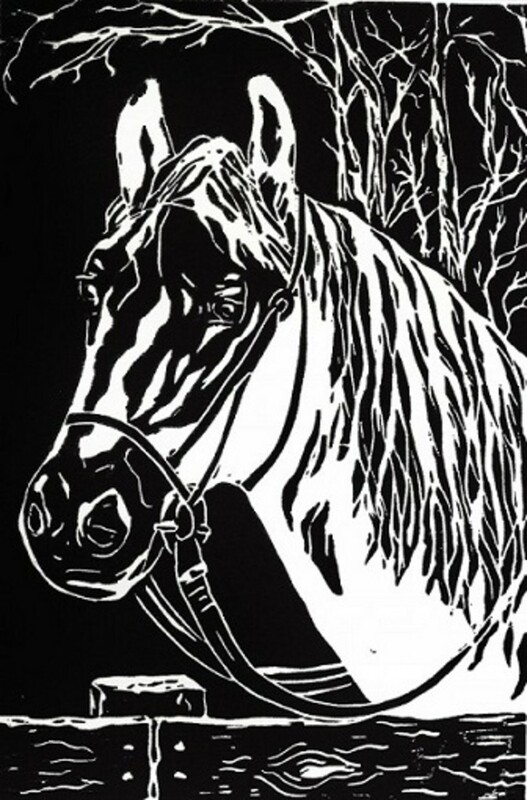 Yes I have received several commissions to create linocut pieces. Here are some examples of the work I have done on commission. 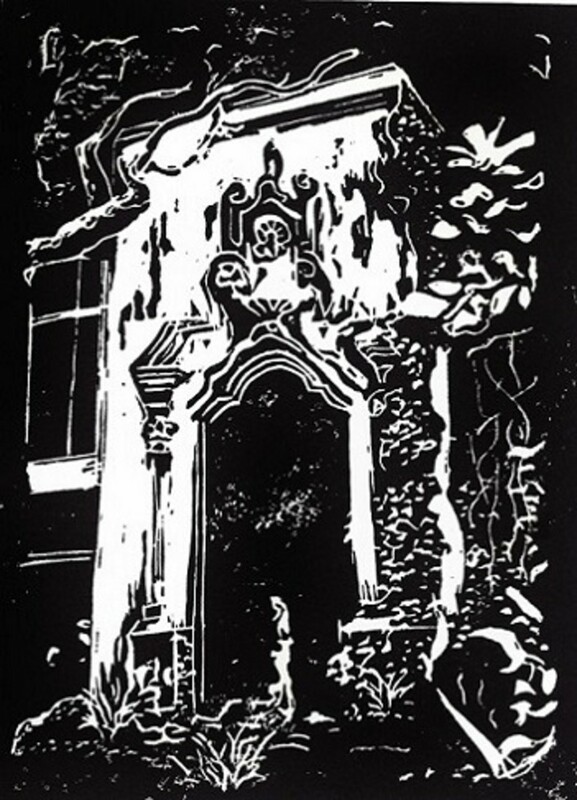 In one case the person wanted to have a linocut created of their old family farmhouse prior to it being destroyed. She sent several photos and I worked from those after discussing it via telephone. Another one was a dog's face. She sent a photo of the dog to me. It became a Christmas gift to her boss who owned the dog. One of them ended up being gifts for the board of directors of a business. It was an old rice dryer in Brookshire, Texas after they had seen the one I had created of the one in Katy, Texas. In every case they also received the linoleum block upon which it was carved along with the prints. Thank you for asking. Happy to be able to inform you about this type of art. You were most probably familiar with woodcuts. 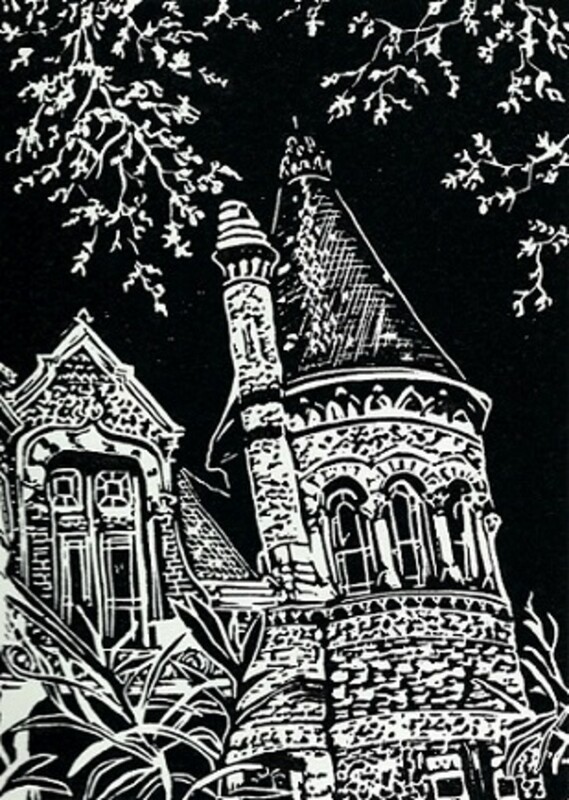 Linocuts are similar but the medium is softer to carve. Your art is wonderful, Peggy. I admire your skill and your patience! I loved looking at your photos. I voted in every poll, but it was often hard for me to choose a favourite. Your work is amazing, quite detailed and intricate. The black and white architectural pieces are bold and dramatic, I love them all. They would make great book cover art, have you been commissioned yet? Your article is very well written and rich with information, quite a pleasure to read, thanks. You are very talented with linoleum cuts. I didn't know there was such an art form until I read your article. Creating all forms of art takes time and patience. I am sure your stained glass is very rewarding when you get to see the beautiful colors and patterns. I have a cousin who has created some beautiful stained glass panels and windows. That takes talent also! Thanks for your comment regarding my linocuts. Hi Peggy, And I thought making my stained glass art was tough. This process souds so tricky and time consuming. I loved all the prints and had difficulty choosing a favorite. I like the way you inserted all those quotes as well. Great article. 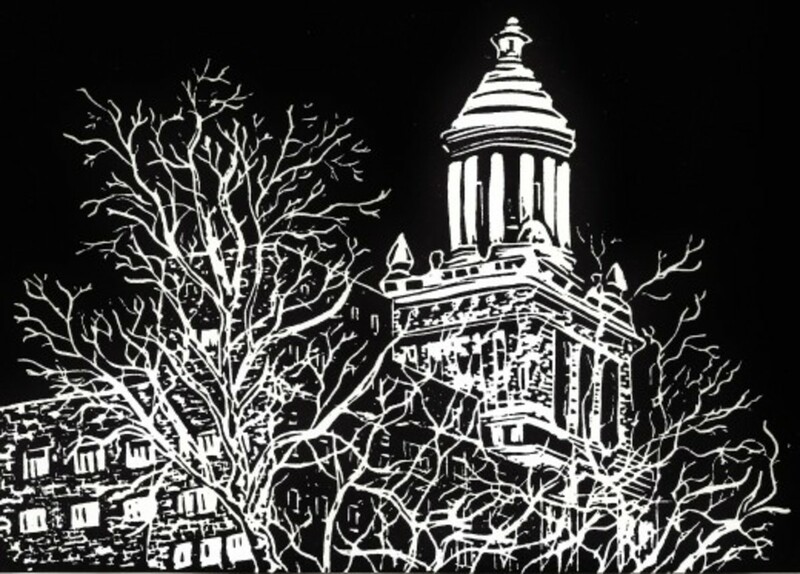 Hope you try your hand at creating some linocuts. It is always amazing when printing some artist proofs to see what has been created after the carving process. Sometimes it is even better than imagined! At least I find it to be that way. Of course sometimes it just does not work out but lessons are learned. Wow Peggy - These are stunning! This is an art form I've always been interested in trying. Thanks for the compliment Mary. 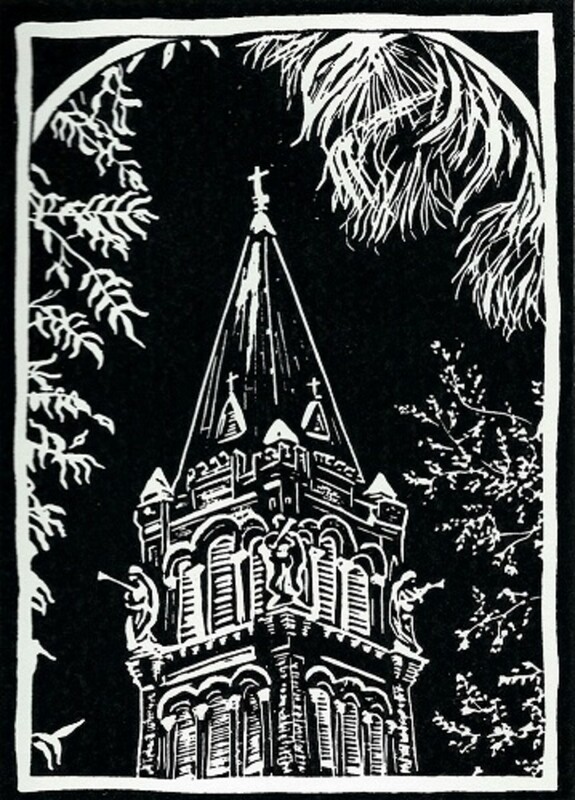 I had fun creating these linocuts and may start doing some more in the near future. I am impressed at the ones you featured here. I don't know if I will have the patience to do some of these. They are truly amazing. You were quick to make a first comment. 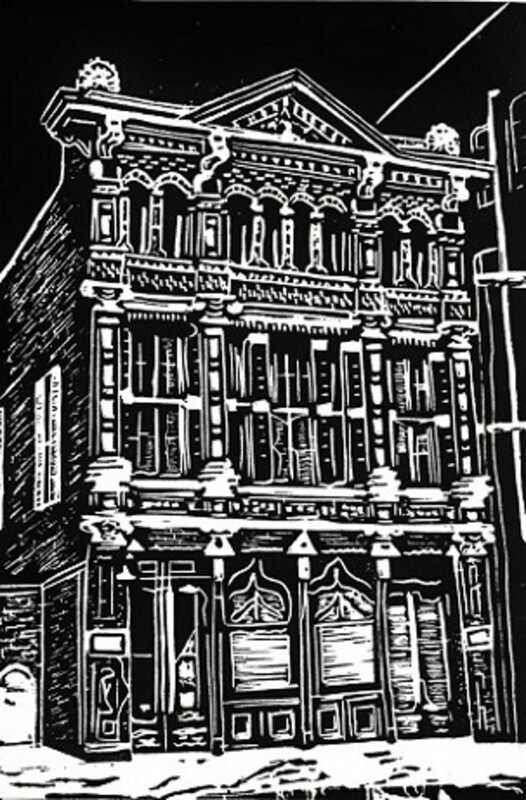 There is definitely waste when it comes to creating a good linocut print. Quite often I have printed many more that do not make the cut to be numbered and signed. It is all a part of the process. I am so impressed! It looks like a complicated and messy process. You must be a very good artist and have the patience of a saint. Congratulations on both your talent and skill.